Microsoft tested a self-sustaining underwater datacenter called ‘Project Natick’, which according to the company is quick to deploy and can be used to save the energy needed to cool the servers on land. The U.S. tech giant submerged the experimental data center fitted under a shipping container-size prototype, off the Orkney archipelago in northern Scotland on Wednesday. For those unaware, Project Natick is an initiative by Microsoft to test the feasibility of an energy-efficient, low-latency cloud computing facility on the ocean floor and to bring cloud computing infrastructure closer to big cities near large water bodies. Microsoft’s vision is to see self-contained data centers placed hundreds of feet below sea level removing the biggest cost of running these operations on land — Air Conditioning. In July 2014, Microsoft kicked off the first phase of Project Natick but it was formally unveiled to the public only in February 2016. Microsoft then announced that the team had deployed a lab-built proof-of-concept datacenter prototype in 30 feet of water off the Californian coast, which was operational for 105 days. 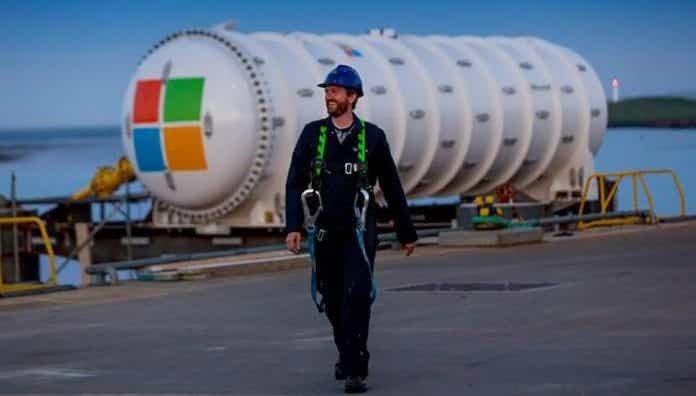 This time in the second phase, the Northern Isles datacenter deployed by Microsoft consists of a 40-foot (12.2 meters) long white cylinder comprising of 864 servers, which is enough to store five million movies and sits at 117 feet below the ocean surface. The current datacenter can “hold data and process information” for up to five years without requiring any maintenance. To get the data center to the seafloor, the team used winches, cranes, a gantry barge, and a remotely operated vehicle to retrieve a cable containing the fiber optic and power wiring from the seafloor. It then brought it to the surface where it was checked and attached to the data center before switching it on. The region is home to tidal currents, which at their peak can reach up to nine miles per hour, with 10-foot waves that can climb to as high as 60 feet during a storm. At full capacity, the system runs on less than a quarter of a megawatt of power, obtained from Orkney Island’s grid. The data center is a “milestone” for the company, said Microsoft. “More than half of the world’s population lives within about 120 miles of the coast. By putting data centers in bodies of water near coastal cities, data would have a short distance to travel to reach coastal communities, leading to fast and smooth web surfing, video streaming and game playing as well as authentic experiences for AI-driven technologies,” it added. The underwater datacenter could also make for more environmentally sustainable operations, Microsoft concluded. For the next 12 months, the team will monitor the subsea datacenter and see how it performs in the underwater environment. With Project Natick, Microsoft is hoping to eventually create underwater technology that completely cuts ties with onshore power. So… need to be a certified diver also to go down and troubleshoot issues?